A Pink Kitty: Hair Scare! As you get older, your oil glands get more active. For most girls this means their hair is very greasy. If the roots of your hair look oily almost everyday, you may have to shampoo your hair often. Stay away from heavy, greasy products such as gels that can also lead to greasy hair. If you must use them, use a nickel sized amount. Does your scalp feel itchy and dry? Are your clothes covered with flakes of skin? You may have a case of dandruff, a very common condition that usually easy to treat. Try a specialized dandruff shampoo from the drugstore. If drugstore shampoos do not work, ask your doctor for something stronger. Hair products such as mousse, sprays, and gels can cause buildup. Shampoo regularly to remove the buildup. Yikes! Somehow you've managed to get a big wad of gum in your hair. Before you reach for the scissors, try this old trick. Spread a glob of peanut butter on the gum. Work the peanut butter through your hair until the gum comes out. The peanut butter will wash out with regular shampoo. 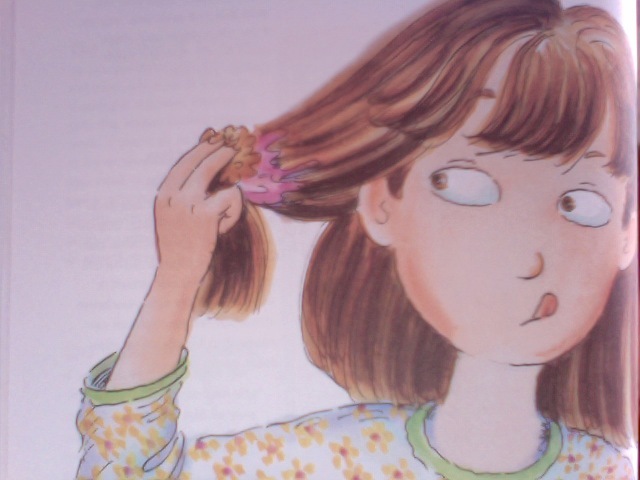 Head lice are a common problem among school kids everywhere. These tiny wingless parasites thrive in thickets of human hair. They bite the scalp, leaving tiny sores that can itch really bad. Worst of all, a single louse can lay hundreds of eggs, called nits, right on your head! Nits glue themselves to hair and can be hard to get out. A special fine-tooth "nit comb" can help pick out the nits. If lice are on the loose at your school, take action to protect yourself. Don't share combs and brushes with friends. Don't swap hats, hair bands, or headphones, and don't trade pillows at sleepovers. If you suspect unwelcome guests on your head be sure to check with your doctor or a school nurse. Live lice are small and gray, and move around. Nits look like white grains of sand, found along the hairline above the neck and below the ears. If it turns out you have lice, you can buy delousing products at the drugstore. Follow the instructions carefully to get rid of lice completely and to keep them from coming back.